If you placed your order before 11am Pacific/2pm Eastern time it will ship out the same day. If you placed your order later in the day, it will ship out the next day. To most places, USPS Priority ($5 option) it will be 2-3 days from the day we ship it until it is delivered. It may be one day more to some very rural locations. USPS Express ($19) is overnight to most places, and 2 days to some rural locations. Both USPS Priority and USPS Express deliver on Saturday. USPS does not guarantee delivery times. FedEx Priority and Standard Overnight are both overnight Monday through Friday, and FedEx 2Day takes two days, Monday through Friday. Please be aware that no FedEx deliveries are made on Saturday, and orders placed with FedEx shipping after the cutoff on Friday or Saturday will ship on Monday. If you are considering using FedEx Overnight, this means that if it's Thursday (after 2pm EST/11am PST), Friday, or Saturday, it's faster and cheaper to use USPS Express. If you are considering FedEx 2Day, this means that if it's Wednesday (after 2pm EST/11am PST), Thursday, Friday, or Saturday (before 2pm EST/11am PST), it's faster and cheaper to use USPS Priority. FedEx guarantees delivery times. I'm new to Kratom. How do I decide what strain to get? While we can't make any recommendation that is perfect for everyone, you might start with our most popular strain, Bali. It's the best kratom for the price we've found. The Maeng Da is excellent and quite a bit more potent. The Red Kali is our staff favorite. We also have sample packs available for those who want to try many different strains or a blend. The Ultra Enhanced Indo is our favorite extract. I need to upgrade my order to a more expensive shipping option, or add an item to my order. What do I do? Unfortunately, as a security measure, we do not save any payment information on our site. Once an order is processed, we cannot increase it's value. If you want to modify an order to a faster shipping option, or add an item, the best thing to do is to e-mail us, to cancel the original order, and then place a new order that reflects your preferences. I forgot to add my voucher to my order. Can you add it for me? Unfortunately, we have no way of applying a voucher once an order has already been placed. Make sure you enter in your voucher on the first page of the Shopping Cart before you place your order. All our orders arrive in generic USPS or Fedex packaging. The return address is only a name and address in Berkeley, CA. To apply your loyalty points, after you login, on the left hand side there's a pink box titled "My Account". At the bottom of that box is a link called "My loyalty points". In there, you can convert your loyalty points into a voucher code. Click on your Cart (box in the top right corner), and there will be a box to enter a voucher code. Enter the code that was made from your loyalty points in that box and it'll apply the points. On the top right corner of the page in the Cart box, click the "Cart" button next to the "Check out" button. There will then be a box in the middle of the page that says Vouchers, and asks for a Code. Type or paste your coupon code in the box and click, "add." It should apply your discounts as soon as the page refreshes. Note that the Vouchers box will not be there if your cart is empty. You have to add something to your cart first before the Vouchers box appears. Where is my order right now/Tracking not updating? "Not Found: The Postal Service could not locate the tracking information for your request. Please verify your tracking number and try again later." -- This message means that USPS hasn't added the tracking number to their system yet. Your tracking information should update after a few hours. If you're still getting this message a day later, that might be an indication of a problem, so please e-mail us about it. "Pre-Shipment Info Sent to USPS" --Your order has shipped, but has not yet been scanned in by the Sorting Facility. In most cases, your item will show up as being in Berkeley, Oakland, or San Jose, once it's been scanned in that evening. In rare cases, as shown in the screenshot below, packages get processed and sent out to their destination without being scanned in, or without showing evidence of having been received. If you see this message for more than a day after your package was supposed to have been shipped, this is the most likely scenario, but if you're concerned, you can e-mail us. 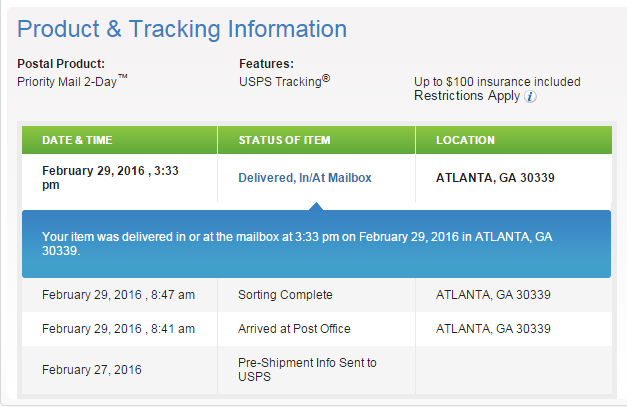 "Departed USPS Facility" -- Everything is good, and your package is headed to you. Please keep in mind, that USPS can have unexpected delays, and its not unusual for packages, especially Priority packages to take a day or so longer than their shipping estimates. "Arrived at USPS Destination Facility [Your Location] / Out For Delivery [Your Location]" -- If your package has been marked as having arrived at the USPS Destination facility where you are, it means that your package will most likely be delivered within a day. If you've seen this message and more than a day has gone by without receiving your package, it might be a mistake on behalf of your carrier. The carrier may have delivered it to the wrong address, or left it in their bag. Try leaving a note in your mail box for your postal carrier asking where your package is, asking your neighbors or housemates if one of them has it by mistake, or calling your local post office. "Arrived at USPS Destination Facility [NOT Your Location]" -- If your package is listed as having arrived at the sorting facility in the wrong city or state, that's an unfortunate USPS Error. In many cases, this can be a bug in the tracking number system, and your package will be delivered on time, or with minimal delay. In other cases, it means your package was mistakenly routed to the wrong sorting facility, and it'll take a few days for USPS to correct this mistake. Unfortunately, there's nothing we can do to prevent this from happening, or speed things up, when they do make this mistake. If your package doesn't move for over a week, please e-mail us. USPS Priority users, please keep in mind that what we call Tracking Numbers are actually Delivery Confirmation numbers, and so updates can be infrequent and unreliable. How do I order quantities different from those on the site? If you want to order a quantity other than the ones listed on the site, visit the shopping cart page and click the + button in the Qty (Quantity) column. Note that the price for a particular quantity of the product stays at the same level when you adjust the amount in this way. In other words, you don't get the normal price reduction for ordering a larger amount. For example, in most cases, ordering the 1-oz, and the 2-oz quantities of a product is going to be cheaper than ordering the 1-oz and then changing the quantity to 3. This is unfortunately due to a limitation of our shopping cart software. This usually happens because your billing address doesn't match the address for your credit card. Please correct it and try again. If it's still giving you an error, then the card is being denied for some other reason. Please try a different card. If you receive a payment error, a temporary authorization/hold may appear on your credit card account. You will not be charged for any of these, and they will go away in a few days. This happens any time a credit card transaction is denied for some reason. Just because this is showing up does NOT mean your order went through.